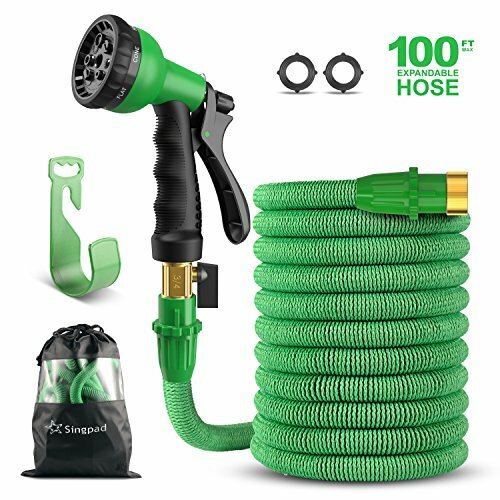 PERFECT GARDEN HOSE KIT - The Perfect Expandable Hose Start Out 33ft and Expand to 100ft With water pressure;3-Piece Hose Set includes Hose Storage Bag and 8-pattern spray nozzle for versatile effectiveness. UNIQUE CONNECTOR DESIGN-Singpad Flexible Garden Hose Use Special Connecter Design Makes The Hose Free From Loosing,Disparting or Water Leaking Problem. GUARANTEED SATISFACTION - If You Don't Absolutely Love your Hose, Let US Know And We'll Give You a 100% Refund Or Replacement.Customer satisfaction is my top priority! If you have any questions about this product by SingPad, contact us by completing and submitting the form below. If you are looking for a specif part number, please include it with your message.